The PRC already set the final schedule of the board exam this coming October 2014. Both the Licensure Exam for Psychologists and Psychometricians would be held that month. It's like six months away, right? 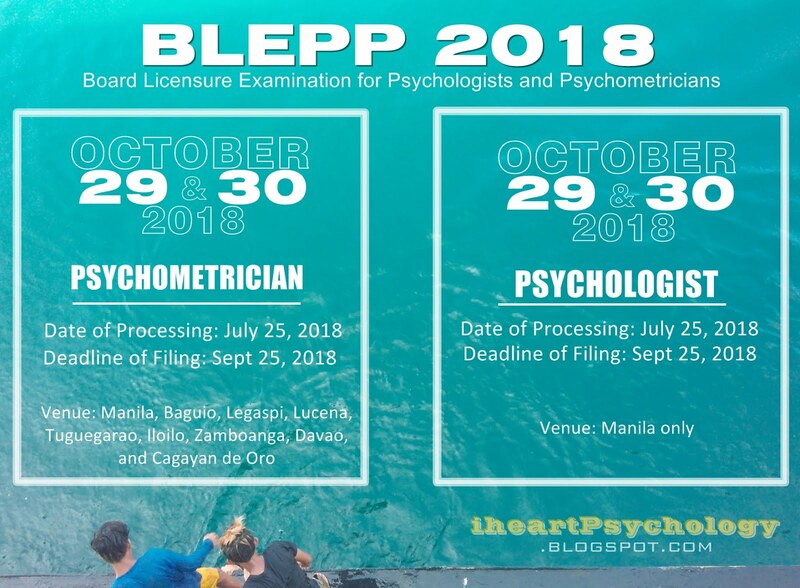 So, we better prepare ourselves if we want to be included on the first list of Licensed Psychometricians and Psychologists. So, in preparation for the boards, Psychology graduates who are qualified to take the board exam should be reviewing their notes now. As for me, I have to deal with several concerns first: a) I don't have Industrial Psychology subject on my undergraduate course, b) our TOR do not have the SO number on it and c) I have to take my deficiency subject to qualify for the exam. Yeah I know, good luck for me. In line with that, I made my blog a way of helping psychology graduates with the important things related with the board exam because I cannot find useful sites dealing with this important matter. And as a little help, I made my own reviewer. I am giving away copies for free. It's an outline I made from my college notes and reference books. Also, I included some useful links on the web that you can also check. It is divided into 5 parts and I'm giving the links to those who think my reviewer could help them. Follow me first on Google+ (click this link) or on Google Friend Connect located on my sidebar (so you can receive updates from my blog). Leave me a Message with the title: I WANT A COPY OF YOUR REVIEWER using my Contact Form (on the lower part of my sidebar) and state a reason why you needed my Reviewer. Then, I'll send you a copy which you can print and use as a reference. I made my reviewer using only my reference books, old college notes and some useful websites. Know more about my reviewer HERE. This is not an official licensure exam reviewer and it is on an outline form (not a questionnaire). Here's a preview of how my reviewer look. If you find my reviewer useful, I would appreciate it if you leave me some comment. Thanks for giving my blog some time. Please help me spread the word. Good luck to all of us.